Genealogists are notorious for their paper piles. Did you know your excessive amount of unfiled or unorganized material (paper or digital) might indicate a more serious genealogical problem? Falling prey to this problem is so easy, I do it periodically. Recently I was reminded of what I should be doing. That simple reminder adjusted how I approach my in-progress client work. It was that important. 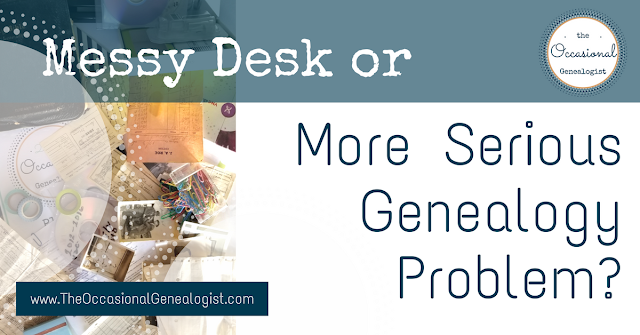 So today, I want to help you identify the difference between a simple problem with clutter and being disorganized, versus a more serious genealogical problem that IS affecting all your research. This post won't give you a recipe for filing success. But if you're guilty of the problem I'm discussing, addressing it will improve your organization in the long run. First, let me break down the situation into three basic categories. Your disorganized research can indicate one of these three categories of problems. You are just disorganized. 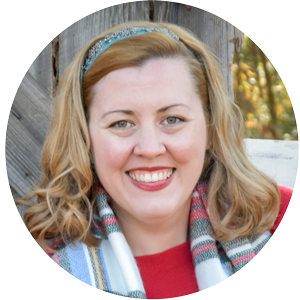 You don't need this post, you need one of the many books or courses about organizing your genealogy material. Yes, you're disorganized, but the reason is your problem, and you have a beginner's problem; you collect names, you don't do genealogy research. Yes, you're disorganized, but the reason is your problem, and you have an intermediate problem. You collect documents, forms, kits, courses, anything to help your research. You need to take another step to go from collecting to researching. You shouldn't be able to quickly identify which of these you belong to. It should at least take some thought but more likely, you need to learn more about the problem (and I bet you'd like to know how to resolve it). I'm not going to talk about the first category, just plain disorganization. That's several posts of information, and it's well covered elsewhere. I'll talk about the second two categories in order as they build on each other. This is a fairly common genealogy problem among beginners. The scary thing is, it can keep you a beginner forever. There are people that claim they are experienced genealogists, having researched for 20 or 30 years. After talking with them (this often happens when you're trying to help them with a brick wall problem), you discover they've just been collecting names. Sure, it takes "research" to find those names. That's what's tricky. You think you're doing research. Most likely, if you're reading this post, you only have this problem if you really are fairly new to genealogy. That's fine, collecting names is a way to get started, it just won't get you far. Learning more about genealogy research, different techniques, what to do besides searching for names, all of that gets you past this problem. That's why it's unlikely you're reading this, and you're a 20-year name collector. Reading blog posts is a type of education (you're looking for some type of help, right?). Realizing you aren't progressing and looking for a solution is really all it takes to get past this problem. That will not automatically fix your disorganization. You might just go from being a collector to just being disorganized. You've got one less problem to fix, though. Just collecting names might actually keep your research fairly well organized. You're generating a lot of material, everything mentioning the name you're interested in. It's easy to file, though, simple surname files or maybe locations for each surname or given names for each surname. The options are pretty straightforward. As far as organization and being a name collector, starting to do research will reduce the amount of material you have to organize (you can collect names much faster than you can do actual research). If you realize you're a name collector, put some effort into an organization system that works for research, now. 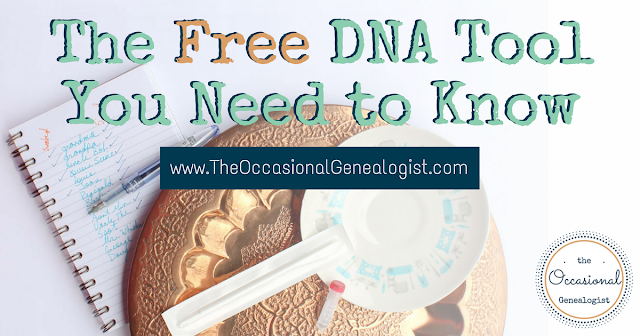 If you start to learn about the issues experienced genealogists have addressed, you should start to see what else you need to do. Be aware if you're just collecting names or if you're following the full research process. I'll talk about the research process with this next problem, which is a doozy. OK, maybe you're not guilty of collecting names. Maybe you've overcome that problem. There's another insidious problem you may have fallen prey to. It happens in all kinds of industries. You collect ____________. In this case, it's genealogy material, but it can be documents or forms or courses or... That's why you have such a disorganized mess. You're collecting material. You're not completing the research process. This is where I needed a reminder. My specific problem was related to researching for clients, I don't tend to fall into this trap personally (it's easy to avoid since I research for myself so little!). When we're talking about your personal research, this is a much easier issue to discuss. There's no one else involved, so you need to go through the full research process. You don't just pull a name out of the air, pick a source to check, and then file away any items with the name. That's collecting names, not doing genealogy research. So you've gotten past that. You hopefully make a targetted plan and check carefully considered sources. You should record negative results (where you did not find what you were looking for) as well as positive results. But you don't just file away the material after you find it (or in this case, stick it in a pile, because you're disorganized). You need to review what you've done. That includes comparing what you did and didn't find this time to what you've done before (correlation). It also means analyzing the individual items you found (and possibly analyzing your negative results, depending on the situation). You should be writing up what you did (reporting). Why does disorganization indicate you may not be doing this? You have time to find more material (that you're not filing) if you are skipping correlating, analyzing, and reporting. If your piles keep growing, are you just collecting material? If you're an Occasional Genealogist, this can become a sneaky problem. You might know you need to follow the complete research process. But you want to get as much material while at a repository as you can. This is the problem I have. I don't recommend against bringing home "collected" items to analyze later. I give you the same advice I give myself. At some point, stop collecting and finish researching. You can do this in several different ways, all of which can fit into little bits of time. You can attempt to organize your mess (file what needs to be filed) while taking note of what you need to work on. I don't like this approach because filing is no fun and this requires a lot of filing. However, this might work for you, and it's perfectly OK. I don't like it only because it's no fun and therefore less likely to be successful. You can instead choose a project and find the material you need. In this situation, I recommend doing some minor organizing of everything you touch. Yes, the advice to only touch an item once (i.e., file it immediately) is good. It's just not always practical if you're trying to work on a specific project in 5-15 minutes segments. You may be able to establish a process before you get started (for example, have five piles, one for the project you want to work on and one for each of your four grandparents lines). This will at least make your piles more useful. However, focus on achieving your project (if that's the option you've chosen). Don't get distracted. It's very important if you're doing this in multiple small sessions to know what you've done and where to start next time. Account for time to "report" on your progress if you need to. Using tools like file folders, plastic envelopes, and plastic file boxes can help with paper clutter (and you can use sticky notes on the outer containers---they aren't archival safe so don't put them on your papers). With digital clutter, use digital file folders and cross-referencing (linking files through shortcuts or hyperlinks). What you do depends on how you organize digitally. If you are filing files or organizing Evernote notes, it'll be similar but different. I said this type of problem can occur in other industries. The most common issue in other industries is collecting material to help you. 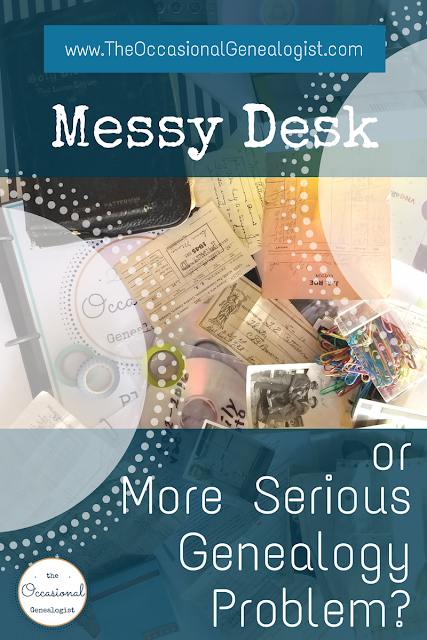 Is your mess because you're collecting blog posts, books, forms, kits, cheatsheets, courses, syllabi, and other material? Maybe it's time to stop organizing and learning and time to start doing? Use your forms or toss them and stick with paper or basic word processing documents. Read one quick item and then apply it immediately (or maybe you don't need to read it AGAIN, maybe you're ready to try it out). I hear this advice a lot as a blogger. There's tons of free and cheap help material out there. It's also scary to post a blog post where the whole world could read it. So many bloggers collect material to teach them how to do something new. And they never actually DO it. You don't have the issue of the whole world potentially seeing your genealogy. Just get started. You should be pausing to review. That's why we write reports. It's perfectly fine if your reports to yourself include questions because you're not accomplished in one area or another. That's even more reason to write a report. In a few weeks, months, or years, your more experienced self will know to review the research done for that report and see if there are any new clues you didn't recognize before. You can see if there are errors that may have caused a problem in the research that followed (so best to NOT leave years before you read a report again). 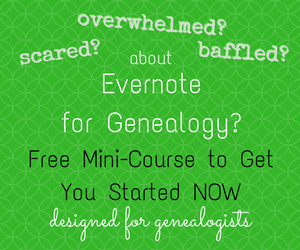 Are You a Genealogy Researcher or a Genealogy Collector? Messy genealogy material can just be a mess. It might also indicate you're focusing too much on collecting and skipping planning, correlating, analysis, and reporting. If you go through the full research process, you will collect fewer documents in the same amount of time. If you start with an organizing system (a file system or digital organization system), it should be much easier to keep the document you create (plan, analysis, notes, report) organized than a stack of documents you bring from an outside location. Fixing your collecting problem won't guarantee your filing woes are over. If you don't fix it, you'll just have two problems. Collecting instead of researching is a severe problem. 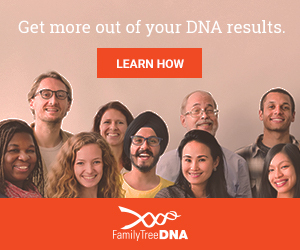 It can essentially stall your genealogical progress permanently. So, do you have a filing problem or a collecting problem? How are you going to fix it THIS YEAR? Leave a comment with your fix or ask a question. I like this but it also tells me I have a lot to learn. Hi John, I'm glad you liked the post. It's great you recognize you have more to learn. Now you have the opportunity to help yourself move forward (instead of wondering why you're stuck, and wondering, and wondering...). You described me to a big fat messy "T"
I've known lots of messy genealogists of this type, Holly. It made it easier to describe. And I definitely have a problem collecting forms (and I prefer just using MS Word to record genealogy!). I'm also very guilty of collecting courses and blog posts as a blogger so it's not too hard to describe yourself.